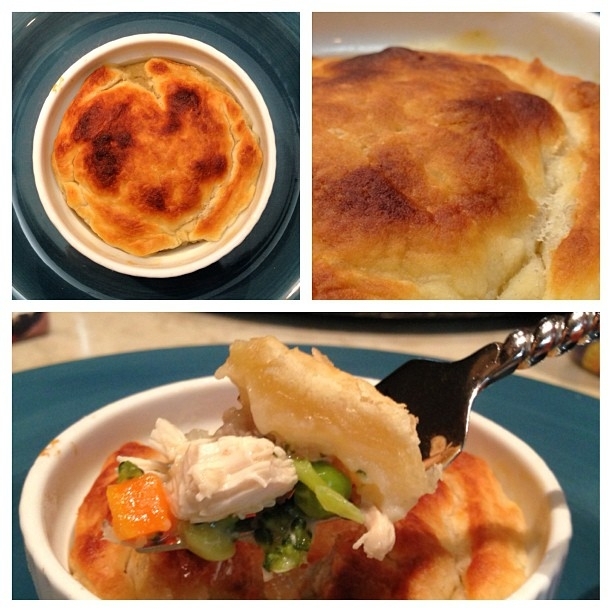 Love chicken pot pie? I DO! Unfortunately, itâ€™s generally a healthy meal in disguise from all of the butter and the killer- the crust! Now, the crust was too essential to eliminate it completely (or else youâ€™re just essentially eating chicken and veggies!! ), but how about a single serving with just a crust topping? Brilliant and satisfying! Cook frozen vegetables according to package directions. In a saucepan, combine chicken broth, greek yogurt, almond milk, flour, sage, and salt and pepper. Stir until mixture becomes a thickened sauce. Stir vegetables and chicken into cream sauce. Evenly distribute pot pie filling into 8 single serving ramekins/ovenproof bowls. If mixture seems too thick, feel free to add a bit of extra broth to each serving. Place puff pastry piece on top of ramekin, pressing dough along side of container to seal. Poke a few holes in the top with a toothpick. Brush egg white on top of each individual pie. Enjoy warm, but donâ€™t burn your tongue! These babies will obviously be quite hot!